Dividend investing is a challenging sport. Trying to find the market’s best income stocks is a complicated process not least because those stocks with the highest yields, tend to produce the worst long-term returns. The best research on this can be found in the research paper High Yield, Low Payout, compiled by Credit Suisse analysts Pankaj N. Patel, Souheang Yao and Heath Barefoot. To try and figure out which income stocks investors should be spending their most time on, these analysts simulated a dividend strategy from January 1980 to June 2006, limiting their universe to stocks within the S&P 500. They separated the stocks under consideration into equal-weighted decile yield ‘buckets’ to figure out which produced the best returns. What the study showed is that the stocks with the lowest payout ratios performed the best. Specifically, those companies with a low dividend yield and low payout ratio returned 16.9% per annum from January 1990 to June 2006. Meanwhile, companies with a high yield and low payout ratio returned 19.2% per annum over this period. Returns data includes dividends. 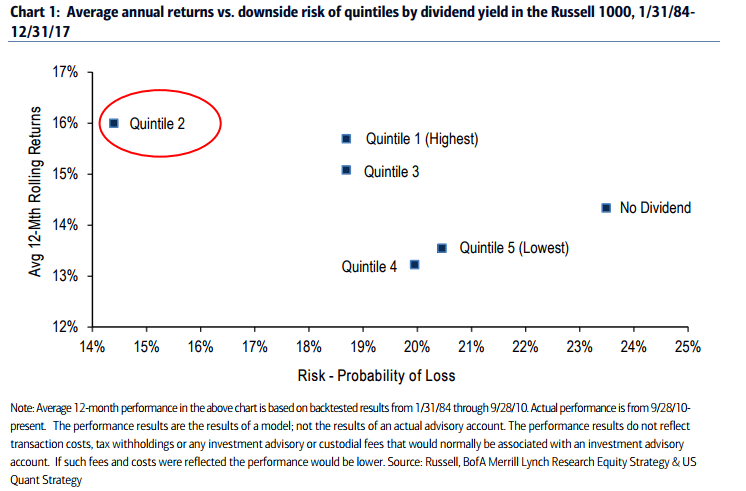 Going back to 1984, as far as BoA's analysts have backtested the model, quintile two has produced an average 12-month rolling return for investors of around 16%, with a probability of loss of less than 15%. Currently, companies ranking in quintile two yield between 3.22% and 2.32%. Some of the companies highlighted include Phillips 66, Principal Financial Group, Inc., Air Products and Chemicals, Inc., Kellogg Company, Sabre Corp., Carnival Corporation and Foot Locker, Inc.